Featuring home and away jerseys and shorts for all ages, wear the pride of the 57 official titles winning champions in the Saudi Professional League, Al Hilal Saudi Football Club. Aesthetically and functionally pleasing, the collection features eye-catching designs and technologically advanced innovations to keep you comfortable. Besides the official team jerseys, you can also grab yourself a team t-shirt to wear anywhere you go, chock full of team spirit. Originally known as the Olympic Club, Al Hilal FC was founded on October 15, 1957 by Abdul Rahman Bin Saad Saeed. That name, although, lasted just for a year before being renamed into Al Hilal FC that we know today. It was changed by King Saud Bin Abdul-Aziz in 1958 after he attended a tournament that had the Olympic Club, Al Shabab, Al Riyad and El Kawkab clubs contesting against each other. After years of building the squad and progressive training, the club lifted its first cup in 1961 – the King’s Cup. That win helped spark a period in which Al Hilal FC won 50 official competitions. Al Hilal FC won the Saudi Premier League 13 times and finished as runners-up on 12 occasions during the span of 32 years. Adding to the list of their trophies, they’ve also won 7 King’s Cups, 12 Crown Prince Cups and 8 Saudi Federation Cups. Their history is one of the greatest in the Middle Eastern football scene and Nike knew that if it had to partner with any football team, it had to be Al Hilal FC. 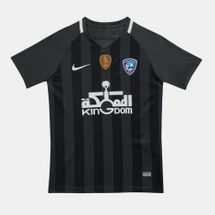 The Nike Al Hilal FC collection features all the team’s jerseys, shorts for people of all ages so that you too can bask in the glory of one of the best teams in the Middle East. Shop online with Sun & Sand Sports and have these products delivered to your doorstep in Dubai, Abu Dhabi or anywhere else in the UAE.